Deluxe High Dusting Kit includes essential wands and a ProBlade Hard Surface Tool to tackle high dusting needs. 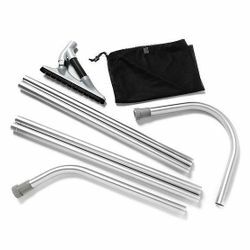 With a range of capabilities, these extension wands deliver on accessing and effectively cleaning high and hard-to-reach places. Expandable Reach - expand the reach of your ProTeam commercial vacuum by 10-12 ft. of effective cleaning. Storage Bag - keep all your cleaning tools in one place.